The growth of suburbs Indooroopilly, Chelmer and Graceville owes much to Walter Taylor, a man small in stature but large in character. It was Taylor who conceived, constructed and financed the building of the cross-river toll bridge at Indooroopilly that was opened in 1936 and now bears his name. Walter Taylor was a devout Methodist, in fact a lay preacher in that faith. His brother Arthur became a Methodist minister, and his grandson Noel Davis, also a minister, is the author of a book about his grandfather entitled "The Remarkable Walter Taylor". After Walter Taylor's father died as the result of an accident at his construction business, Walter and his family moved to England, where Walter learned about engineering, architecture and construction "on the job". Apparently he never had any formal training in any of these disciplines - he had been self-taught since working in his father's construction business in Brisbane. After ten years in England, the Taylor family returned to Brisbane in 1912, and Walter started his own construction business. As a member of the Sherwood Methodist community, Walter was invited to become involved in finding new accommodation for a Sunday school in nearby Graceville. Property was sought and bought, and Taylor was appointed Honorary Architect and supervisor of the project. A new hall, built by voluntary labour, was opened in 1917. In 1928, Taylor was invited by the Methodists to draw up plans for a new church in Graceville. The foundation stone was laid in March 1929, and the building was opened by the governor in November 1930. Here is a photograph of it during construction. The construction of the Graceville church was achieved largely by donations of cash and materials, not to mention voluntary labour, during the Great Depression. In this project Walter Taylor used precast concrete, a technique that he had acquired in England. As well as his construction skills, Walter Taylor proved to be an innovative thinker about finance, and this attribute was to stand him in good stead in his later project, the Indooroopilly Toll Bridge. Here is a photograph of the church as it stands today. Like the Walter Taylor Bridge, the church has been included on the state's heritage register. But that was not all Walter Taylor was to do with this church. He prepared plans for the construction of the next door memorial hall in 1947, and it was opened in 1951. Walter Taylor died in 1955, and one of the provisions of his will was to pay out the church's overdraft and loans. Recently the church celebrated its 80th birthday, and the current governor was on hand to formalise the occasion. 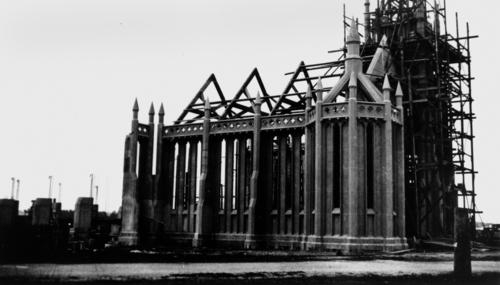 Noting the beauty and poetry of the interwar Gothic architectural style, she pointed out "the 34 buttresses representing Christ's 34 years on earth and the ‘trinity' of light emanating from the 3 windows in each bay of the building" and paid homage to Taylor's achievement of completing the church within two years during extremely difficult times. I've always loved this church. Thanks for the history lesson.